It’s the best. The tops. That’s what it means. It’s simple. But still there’s something else swirling around my mind. I can’t get away from it. I should be thinking about Gail, the lady behind the desk. The one who answers the phone when I call the corporate office. The one who sent me the eight page insert that the Commercial Appeal ran to commemorate Tops first fifty years with the post-it note stuck to the front wishing me well (Joe, Good Luck with your Project! -Gail). And about Mr. Montague, Tops’ General Manager, who for 28 years has ridden the roads of Memphis , stopping in at all the locations and making sure that each of them is as good as its name, who was nice enough to sit me down in his office and tell me the tale of Tops. Dreidel, dreidel, dreidel, I made you out of pork . . .
George Montague: My name is George Montague. Joe York: What’s your occupation? I’m the General Manager of Tops Bar-B-Q. 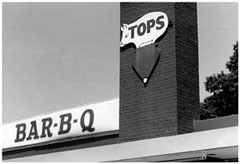 Were you the founder of Tops Bar-B-Q? Oh, no. I just work… A gentleman named J.W. 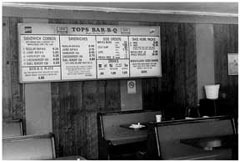 Lawson started Tops Bar-B-Q back in 1952. And G.E. Messick, his nickname is George, but his name is Granville Messick, he came with him, I think, in ’63 or ’64 or ’65, somewhere along in there, and he’s the owner of the company now, G.E. Messick. And you’re the General Manager. General Manager. I’m a company officer. When did become involved with the company? It’ll be twenty-nine years this December. Have you always been on the business end of Tops or were you ever in the restaurants cooking or anything like that? Well, no. I started out years ago. The first title I had was Personnel Manager of Tops Bar-B-Q. From there to Operations Manager and now General Manager. 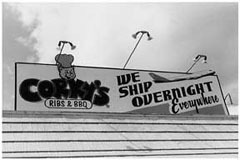 Can you tell me some about Tops Bar-B-Q in general? The meat and how y’all do it? Well, we still do it the old-fashioned way. We cook the shoulders over an open pit fire for eight to ten hours depending on the size of the shoulder. 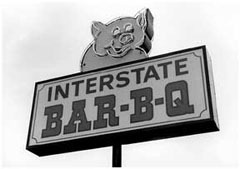 I know a lot of the people that are in the barbecue business now have gone to these stainless steel cookers and they have timers and all of the conveniences, but they’re not able to turn out the type of barbecue that we do, which is the old-fashioned way. We cook it over an open fire using hardwood charcoal and real hickory, green hickory wood, which flavors the meat. Y’all have quite a few locations. Just in the Memphis area? Well, we have eleven in Memphis. We have two in Mississippi and one in Arkansas. We’re tri-state now. We got one in Marion, Arkansas, one in South Haven, Mississippi, one in Olive Branch, Mississippi, and all the other eleven locations are here in Memphis. My question is how do you keep that quality control over fourteen restaurants? We strive to have what we call a Master Cook at each location. At this time I think we’ve got Master Cooks in about eight of them and then we’ve got our manager, and most of our managers are Master Cooks by the way, and then we have a lady who trains our Master Cooks. It’s not that complicated, but you’ve got to be vigilant. You’re talking about eight or ten hours of watching a pit, making sure that the pit stays even, making sure the fire doesn’t go out, making sure it doesn’t flare up too much. If you get the fire too hot and it flairs up, especially after the shoulders have been turned… The way we do this, we put the shoulders on skin side down. We cook them three quarters of the way… Well, actually, after they’ve started cooking real good, they do what they call ‘popping’ them. They come along and they pop them up off the grates so that skin won’t stick to the grates. After they’ve cooked three quarters of the way done, then they turn the shoulder over on the meat side. When they turn it over on the meat side it does what we call ‘dripping out.’ It actually starts dripping out, the fat… At that time that’s when there’s the most danger for what we call a ‘pit fire.’ If that cook is not on the ball and watching what they’re doing, they can burn up three or four hundred dollars worth of meat just like that [snaps his fingers]. But, of course, once they turn it over… and all the good cooks know how to do it… they continue cooking it until it drips out, gets completely done, and by turning it over that meat side takes on about a quarter-inch crispness–That’s the outside meat, what you call brown barbecue. Take it off, cool it down, put it in the walk in. Do y’all chop it, pull it, slice it? Any way they want it. Any way the customer wants it. Do y’all do ribs at all? We do ribs on special orders. In our catering we do ribs and, if someone wants ribs, we’ll do them, but just for special orders. We don’t have them on our menu. We’ll do beef for special orders. We do beef brisket. We’ll do chicken. If you can barbecue it, we do it. Tell me more about the business side of Tops? What’s an average day like trying to keep Tops afloat? It can be hectic. But you’ve got to understand, though, I’ve got support personnel. I’ve got an assistant that takes care of anything I need to be taken care of. I have a gentleman… I call him my Utility Man. He runs errands for me. I have a Personnel Manager. She works with the managers to keep the stores staffed. We have a manager in each store, of course, and, then, all the people we need to run it. Of course, this is the food business and in fast food you have a moderate amount of turnover. But I’ll tell you this, we have less, I believe, than these other places, a lot of the fast food places. One of the reasons is because we try to offer a good benefits program. We try to give a good, friendly, family-like environment for them to work in. We started something three or four years ago that’s real popular for our people. On their birthday, if they’ve been with us one year on their birthday, they get a five hundred dollar birthday bonus. Wham! Just like that. You can imagine that’s extremely popular with our folks. And that encourages them to be here for the next birthday, too. Did you work with Mr. Messick? Been with him twenty-nine years this December. He’s still… Yeah, he seventy years old. But he’ll probably live to be a hundred, or longer. He’s in real good shape. He’s still working. He’s still out. He takes care of his end of the business here. He’s the president of the organization. He does whatever he wants to do. And whatever he does not want to do, I do. But if he wants to do something… Like, he will do things that help me. For instance, he’ll make the meat order. He’ll sign the payroll checks. He does a lot of things that takes a little work off of me. Great guy. I’ll tell you what he is. He’s a straight talker. You’re going to find out what he thinks immediately because he’s going to directly give it to you. He’s the kind of guy I can discuss anything I need to with him. I can even argue with him. I can disagree with him. I can disagree with him to the point that he decides that he wants it a certain way and then, of course, I’ve got to go along with him. But he’s not hard to work with. Do you know what he was doing before he started at Tops? Yeah, he worked for Greyhound. He was the traveling troubleshooter for Greyhound. He would go from… You know, these Greyhounds have these feeding places in them, these Greyhound bus terminals. And he would go from place to place… I think he had the whole southeast part of the United States for Greyhound. That’s what he was doing before he came to work… And before that he was in the Navy. But did he have barbecue experience? No. No, he had Greyhound… He had food service experience. I think he was even involved with food some when he was in the Navy. But he hadn’t grown up cooking barbecue? No. He hadn’t done that. 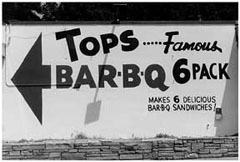 Obviously, since ’52 Tops has branched out, but do you know when that started to happen or where the first one was? When I came to work here back many, many years ago, we opened two that year. I think when I started at Tops we had nine locations. And we opened two. But in the meantime throughout the years, we’ve opened a few and we’ve closed a few. 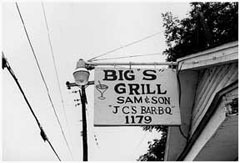 We closed the old original place over on Macon. We closed the one at Park and Semmes. We closed the one over on Jackson at Hollywood. All those are ones we closed. We closed the one out on Poplar. 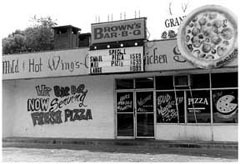 And since we’ve opened… As a matter of fact, we had just opened Frayser Boulevard when I came to Tops. Then after that, we opened Winchester and 4183 Summer, which we call Berclair. Then we opened the one over here on Mendenhall. 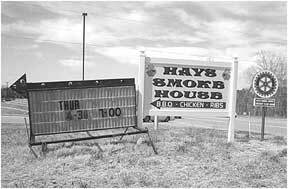 After that we opened one in State Line, on State Line Road in Mississippi. We opened one on Macon and Sycamore. Do you know where that is? Well, there used to be a Wal Mart back there. There’s that Super Sportsman’s Warehouse back there now. If you hadn’t been over there, you ought to go over there. That’s something else. And business comes from several states into that one place. It’s better for us. 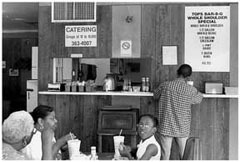 As a matter of fact, since that place opened, at our Macon Road store business has increased by twenty to twenty-five percent because of all of the traffic that it draws in over there. For a while there when Wal Mart closed, we waned. But now, with that place, we’re really booming over there. And, of course, the latest two we opened was one over in Olive Branch and in Marion. Marion’s the latest. Were any of the one’s that are now Tops, were any of those ever Loeb’s before? Do you see yourself as kind of… Because when people talk to me about Loeb’s, it sounds like it’s a kind of similar thing. No we never were Loeb’s. As a matter of fact, Loeb’s… You ever heard of A.B. Coleman? You ever heard of Coleman’s Bar-B-Q? Ok. 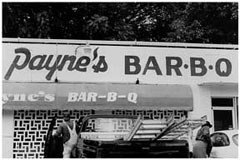 He started Coleman’s Bar-B-Q. A.B. Coleman worked for Tops Bar-B-Q, worked for J.W. Lawson years ago. He learned his barbecue at Tops. 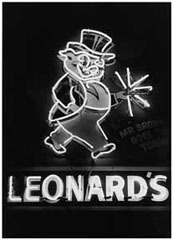 Then he left Tops and went with William Loeb to help open up all these Loeb’s Bar-B-Q’s here in Memphis. They opened up a bunch of them. They were just trying to get locations and they did. They acquired a lot of locations, but they opened them too quick. They couldn’t take care of them. Anyway, eventually what happened was A.B. left Loeb’s and opened Coleman’s. There’s Coleman’s franchises around. I think there’s still a Coleman’s down in Hernando, Mississippi. These Showboats used to be Coleman Bar-B-Q’s. You’ve heard of Showboat haven’t you? And he was trained by y’all? Yeah. He was trained at Tops. He learned his barbecue at Tops. He went to Loeb’s. Then he left Loeb’s and opened the Coleman’s. And, of course, you know what happened to Loeb’s. They just eventually one by one went out of business. We’ve never had a Loeb’s location, never been with Loeb’s in any way. When did they start putting theirs out around town? I don’t know, back in I guess the late ’50s or early ’60s. –Master Cook at each restaurant. What goes into picking who’s going to be the Master Cook and training them and those kinds of things. We’ve got a young lady. You might have seen our thing out of the paper. [Referring to a insert that appeared in The Commercial Appeal Sunday, March 10, 2002, commemorating Tops’ Fiftieth Anniversary] Pat Mann is our trainer of Master Cooks, but we have people who’ve been at Tops for years and years and learned how to be a real good shoulder cook. All you got to do… It just takes patience. You got to be patient. You learn a few things that keep you from burning them up. You know, it’s also important, once you get these shoulders to cooking, to keep that fire going even. If you ever let the fire go out, or get low, and then have to start it back and blow, what it does, it changes the texture of your meat. It’s not the same… It’s not even the same meat. You got to know what you’re doing to get it cooked properly. How does it change the texture? Well, it’ll toughen it. It’ll make it… You just don’t have the same texture. Believe me. I know what I’m talking about. It will toughen it. It’ll even change the flavor of it. She’s been with us off and on for many, many years. She was here when I came to work at Tops. As a matter of fact, I was kidding with her the other day. She and I opened up that Winchester at Elvis Presley store. But she hasn’t been constant. She’d come in and work a while, then leave, work a while, then leave. But she’s helped us a lot since we’ve had her back working with these cooks, working with opening people, opening personnel. There’s more to it than just cooking. They have to get the day ready. Is barbecue all that y’all sell? We have burgers, hamburgers and cheeseburgers. Of course, we have French fries and chips and slaw. We don’t sell hot dogs and stuff like that. We don’t have no barbecued bologna or nothing like that like some of these people do. What we try to do is we have a fairly limited menu. We try to take what we know how to handle and do as well as we can with it. We try to maintain the top quality. We don’t have a lot of items. We just try to do the best we can with what we’ve got. Do people from the different Tops interact a lot? Oh, yeah. They’re buddies, you know. The managers call each other. Weekly we put out a shop standing sheet that shows where they stand, and their cost control, and their sales. It goes from top to bottom, from the best to the worst. They strive to be up in the top part and it don’t make them feel too good when they get down in the bottom part. It gives them something to strive for, makes them compete a little with each other. And they get paid for it, too. They get an incentive. If they’re in the top category, they get a good bonus. If they’re in the bottom category, they don’t. Well, it has to do with the crew and the manager controlling the cost and building the sales. The all go hand in hand. Got to have good sales and have your costs in line. Of course, we’re trying to make as much money as we can, you know. I think right now we have a hundred and twenty-six. Tell me about the name ‘Tops.’ Do you know why it’s names that? J.W. came up with that. He said he thought it would just be Tops. Tops. The best. 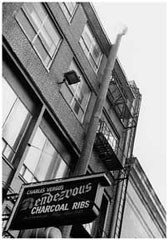 As a matter of fact, if you’ll notice, on our logo on our signs we have ‘Memphis Best Since 1952.’ And we strongly believe that. Have you won any competitions? Yeah. We’ve won a few. Well, not… We’ve entered some barbecue cooking contests, but I found out that they are usually popularity contests. They try to choose… I don’t think it has anything to do with the taste of the barbecue. It has to do with who puts on the best show and who’s the most popular that particular day. They usually get celebrities to do the judging. We’ve gone up there and we’ve placed in those things, but, you know, it goes how they decide it’s going to go, if you can understand what I’m trying to tell you. It’s more or less… It’s not really a barbecue contest. It’s a beauty contest. I’ll give you an example. We entered one once and the winner of the contest was the one… Now, we had some regular old grandmother looking people preparing ours and this other outfit had two young ladies in short shorts and halters serving theirs. They won. [laughs] We just got to point we just quit entering them. Are there any customers who stick out as fixtures in your restaurants? Well, you know, Elvis used to come in and have a barbecue with us. Of course, he don’t anymore. As a matter of fact, we, kind of in honor of Elvis and because of the fact that he used to stop by that store down there right around from Graceland, we decorated that with all Elvis memorabilia. We’ve got pictures of him. As a matter of fact, I’m not through with it. I intend to make it even more Elvis. That’s it. Just for that particular one because that’s kind of our Graceland location. We’re right around the corner from Graceland. There’s a lot of people that come to Graceland that end up wanting to go somewhere that Elvis went. They want to see what he did. So, we have a coupon… I put out some coupons… As a matter of fact, when the people go to Graceland, they get a copy of this coupon. So y’all worked a deal with Graceland? Yeah. It says that Elvis… As a matter of fact, I went to Humes, too. I went to the same school he did. I remember him when he was over there. I don’t know what I did with those coupons. But anyway, I just tried to take advantage of the fact that him and I both went to Humes and we were around the corner from Graceland. And we get people in occasionally from Graceland. You know, they get that coupon and come in there, but they don’t want to use their coupon or redeem it. They keep it as a souvenir and just come in there and get whatever they want. Talking more about dÈcor and artwork and all that, there’s a store on Lamar that’s got a pig on a top. There’s a spinning top with a pig on top of it. Yeah, I’ve been there and seen it. Not at our store on Lamar. I’ve got a picture of it. I’m telling you. Anyway, I was going to ask you if you knew who did that? How long ago did you get that picture? Not at our Lamar store. ‘Home of the Six Pack’ painted on the side of it. There’s a church next door that used to be a bank. 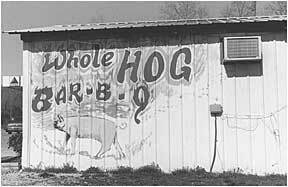 Now, there is a sign painted on the side of the building, but our sign is not the old- fashioned pig sign. It’s the new signage that we have. A pig on the side of the building? Yeah. We’ve got that Six Pack sign out there. Above, kind of to the left… I want to say it’s own the chimney. Oh, yeah. We’ve got the pig on the chimney, on the pit. And it’s on a top, right? Yeah. It’s a pig. It’s on the pit. I know what you’re talking about now. I thought you were talking about… We used to have signs with a pig on the top of them years ago, but not anymore. 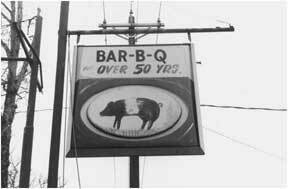 The only place we have a sign with a pig on it anymore is at our… Well, here it is. It’s at our store at… [he walks over to his framed copy of the newspaper insert previously mentioned] See that’s at our old Summer store. I thought that’s what you were talking about. I know where that pig is. That’s on the pit. 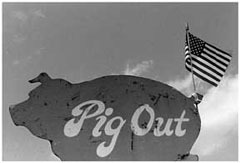 I just wondered if that’s a motif that gets spread around to other stores, with the pig on the top? Well, at some of the older stores, but not any of the new ones. 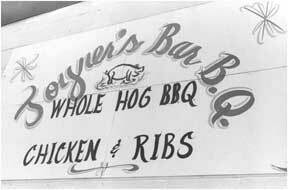 What made you go away from that kind of signage, the old pig signage? Their more expensive and, you know… That’s neon. We do have some neon on our new signs. 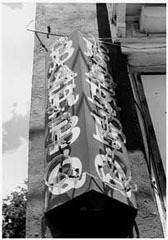 ‘Memphis’ Best Since 1952′ at Olive Branch and Marion is in neon, but it’s on the front of the building. But see that’s neon. That pig up there. [Again referring to the framed insert.] That pig is neon. 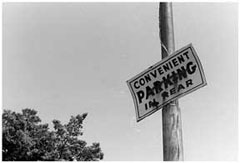 What happened to those signs? The old ones were probably thrown away when we put the new ones in. Like the new sign, right. 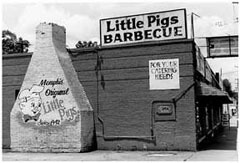 Part of our project started out just looking at pigs in Memphis. Like how do people use the pig? 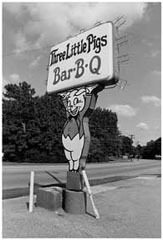 I know Loeb’s used the pig, a little, cute pig standing there. I remember that. You still see a lot of the shape of that pig with other things written on it now. No. No. No we don’t have nothing like that. 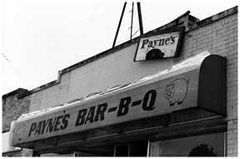 We just try to put out the best barbecue we can put out. No. 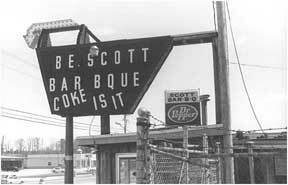 We feel that what we’ve got to do is have the very best barbecue, very best product, period, that we can pt out. We feel like that’s the best thing for us to do for ourselves to maintain our business. We stress freshness and quality, day in and day out, shop in and shop out. In training sessions and meetings that’s one of the things we stress all the time. As a matter of fact, we check it. Our slaw, for instance, has to be made fresh every day. We don’t want no day-old slaw. You can almost… Well, I know you do. You ever go to a place and you get an order of slaw that’s day-old, you know it and you don’t want to come back there again. Do y’all have somebody that goes around and does quality control at all the stores or is that done at the stores themselves? There’s four of us who do it, including myself. I did quite a bit of it today. You go around and taste slaw? Yeah. I go around and I look at it and I tell them. I check things out. If I see that they’re handling the french fries improperly, I tell them. Because no matter what it is, if it’s a food item… As a matter of fact we have a sign that George Messick dictated to us that says, ‘If You Do Anything To Anything That We Sell For Any Reason That Reduces Its Quality, You’re Wrong.’ We just put that sign out everywhere for everybody to read it, because they’ll do little things. They’ll cook up too many fries. We try to pay attention to all the little details that can run you out of business. It’s a full time job. We have to do it everyday. If we find something that’s going on in one of the restaurants, we say ‘Uh, oh, we better check them all,’ because we know it’s happening in more than just one. And, sure enough, when we start checking them, there’ll be two or three more that have started doing the same thing. Do you remember what Mr. Lawson was doing before he founded Tops? Yeah. 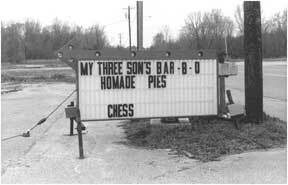 He had a restaurant up on north Main Street. You wouldn’t remember when the old Suzor Theaters were there. It was way back, many, many years ago. 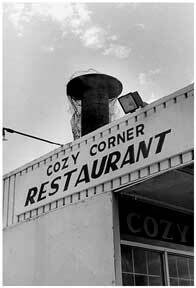 Several doors down from one of those old Suzor Theaters there was a restaurant that had a wide front on it. It didn’t have any tables in it, only stools. It had about sixteen or eighteen stools. That’s what he started and that’s where he got into the restaurant business. Was he cooking barbecue over there? Well, no. He just had food over there. Just food. 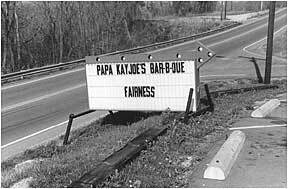 Do you think there’s a difference between food and barbecue? 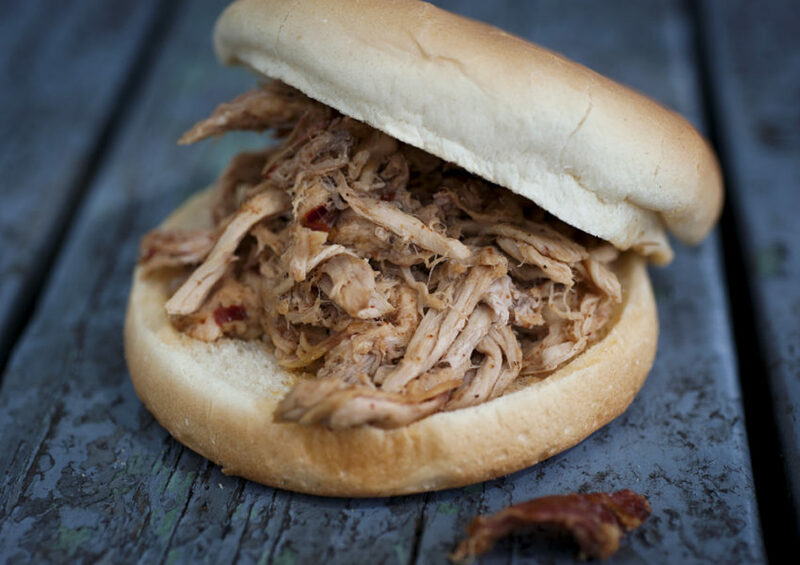 Well, barbecue takes a long time to get it the way it ought to be. 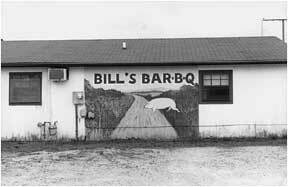 The reason a lot of people haven’t made it in barbecue, the reason they haven’t been able to franchise a lot of these places out like we have, is because it takes so long to get that barbecue from that raw shoulder to that delicious sandwich. It takes so much care. It takes so much attention to detail. You gotta cook it. Then, once you… You know, you’ve got to get it hot and get it out there ready to serve. You can end up drying it up until it’s not even edible. It really takes paying attention to detail to do it and do it right. Do y’all baste them with a sauce while they’re cooking? Nope. We used to have a basting sauce that we put on our shoulders, but we determined that that was not as good as just leaving it as it was. Because when you warm that shoulder back up, that’s when it’s the best. Once you’ve cooked that shoulder, then you take it off the pit, cool it down, and put it in the walk-in, you leave it in there until the next day. Then you take it out and put it back on the pit. When you get that shoulder hot, that’s when it’s best, that warmed up, hot shoulder. A lot of people come in and say, ‘I want a barbecue, but I want it off of a fresh cooked shoulder.’ That’s alright. But it’s not as good as when you warm it up. Because, it takes another step toward bringing that shoulder to the way it should be to be eaten. It just brings the fat and the meat all together to get the flavor. It marries all that together. So, it’s just got to hang out with itself for a day. That’s the best. Nothing wrong with a fresh cooked shoulder. It’s alright. It’s not as good. Are y’all cooking over night, or are you cooking early in the morning. They start cooking in the morning. They burn out their pit at about seven-thirty or eight o’clock. When I say ‘burn it out,’ they put cardboard and boxes in there and they burn it out to where those grates, anything that might be on the grates, is burnt off and cooked off them. Then they sweep those grates down, get them clean, and then they put the shoulders on, and cook them during the day, during the day shift. And that shift is serving the ones that were made the day before. And you’re making tomorrow’s meat today. Right. Except, that evening when those shoulders begin to get to done, that evening, we begin using the fresh cooked shoulders. And the reason we use them that evening is they’re already done, they’re cooked, they’re there, they’re hot. And, you get a fifteen to twenty percent higher yield on a fresh cooked shoulder than one that’s been warmed up. We do it every time we can because we want to try to get that yield. Do people say that the meat tastes different at night than it does during the day? Not really. You know, usually if you’re using a fresh cooked shoulder, you’re putting the salt on it, you’re using the sauce. If it’s a sandwich you fix it the way they want it. It’s delicious. It’s good. I happen to know what’s the best. What kind of sauce do y’all use? We have three sauces. Not too long ago we had several customers that wanted a sweet sauce. So we decided what we’d do we’d just go to a sweet sauce and just eliminate our tangy sauce. When we tried to do that, our old customers came out of the woodwork and they were up in arms. Our favorite sauce is our Old Original Tangy Sauce that we use for our sandwiches. We have that and we have Tangy Hot, and Sweet Spicy. We have those three sauces. No, no. They can request it. And these are all a red, tomato based sauce? Well, we use charcoal and we use hickory also, green hickory. Where do you get your hickory? We buy it from a supplier that just brings it in and sells it to us half a cord at a time. Do y’all keep it wet or anything like that? You don’t need to wet it. It’s green. Once it seasons we throw it away. You don’t want to use any seasoned hickory. You want it to be green. We had a guy with us one time that used to take his hickory and put it in a bucket of water and keep it soaking all the time. You don’t have to do that. Just be sure it’s green. We’ve got two suppliers. Butts Foods we use for half of our stores and we buy for the other half from Metro. Are those here in Memphis? One of them is down in Mississippi and one of them is here in Memphis. But we do that so we’ve got two people to deal with. How many shoulders would you say you cook in a week? I’d say we cook around twelve to fifteen hundred. We cook a lot of shoulders. 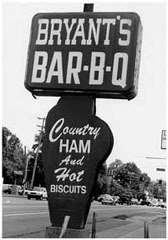 No other company in Memphis could cook what we cook. They don’t have the pit space. About how big is the average shoulder y’all are cooking? Well, we like to get them about twelve or fourteen pounds, but right now they’re running probably fifteen to nineteen pounds. How many do you put on the pit at a time? It depends on the pit. We’ve got some pits that won’t hold but twenty. We’ve got a pit that will hold thirty-six. But see, we could never be to where we couldn’t get our cooking done, and this happens occasionally. 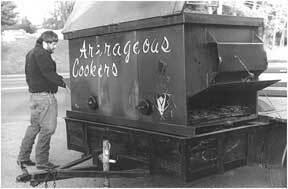 When we have a booming business, like the Fourth of July or any of the barbecue holidays, as we’re building up to that big business, if we need to, we do what we call ‘double pit.’ We cook that morning, then we cook that evening. I can’t think of any other questions.